In general, many refer to their HVAC systems simply as "air conditioners" and are surprised to learn that there is a big difference between an air conditioner and a heat pump. 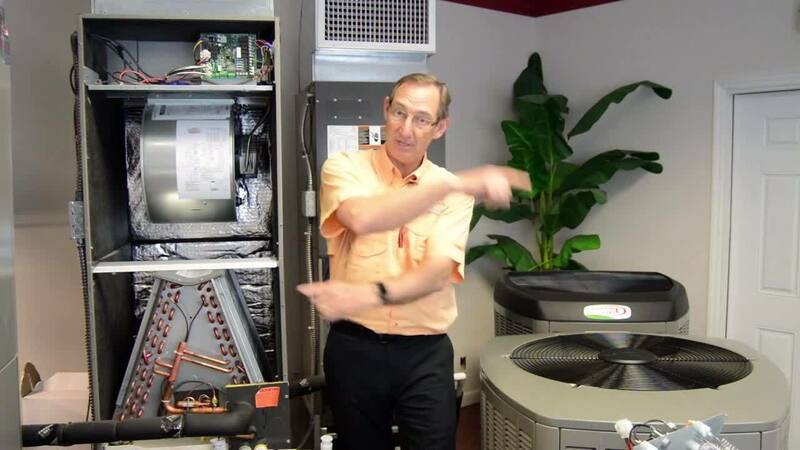 In the newest video released by Tri County Air Owner, Billy Swanson, we learn what we can expect from heat pumps and how they differ from air conditioning systems. What is an air conditioner? In cooling mode, an air conditioner works to remove heat from your home. When the A/C is on, you will feel warm air coming out of the top of your outside unit (condenser). Refrigerant passes through the coil in your inside unit (air handler), so when air is blown over that cold coil, it works to cool your home. In heating mode, the electric resistance heater, which is located inside the air handler, turns on and works to heat your home by blowing air over that heat strip. When thinking of a heat strip, think of the heating mechanism of a toaster oven. In cooling mode, a heat pump works just like an air conditioner. The difference is found when heating your home. The key component of a heat pump is the reversing valve. Heat pumps use reversing valves to reverse the flow of refrigerant in order to cool or heat your home. In heating mode, the reversing valve sends hot refrigerant from the outdoor condenser to the indoor coil and heats your home by blowing air over that hot coil and into your home. Since the hot refrigerant is directed inside to heat your home, the condensing coil outside gets very cold. It is not uncommon to find frost on your condenser when it is in heating mode. When this happens, the defrost board inside the heat pump triggers the heat pump to turn back into an air conditioner for only a few minutes in order to defrost the condenser so it is able to heat your home again. The benefits of having a heat pump are found when heating your home. Since the air conditioner uses a heat strip to heat your home, the electric pull is significantly greater than that of a heat pump when in heating mode. A heat pump can produce the same amount of heat as an air conditioner, for about 1/3 of the cost in electricity. When heating your home, the benefit of having a heat pump is significant savings on your electric bill. Please note: the demand on your electricity varies with the size and efficiency of your system, the estimated savings is in general. One downside to a heat pump is the higher purchase price. The initial purchase price of a heat pump can be $500+ more than that of an air conditioner. Before purchasing a heat pump, consider how often you use your heat to see if you could make up the difference in electric savings. When it gets cold, do you turn on your heat first thing in the morning to take the chill out of the air and then turn it off? Or do you leave it on to heat your home all day? If you find yourself turning the heat on just for a moment, an air conditioner is probably a better choice for you. On the other hand, if you use your heat all day during the winter and you like to keep your home above 72 degrees in heating mode, you would probably save money in the long run by choosing a heat pump. Another downside occurs during the defrost cycle. When the temperature outside drops into the 30-40s, the defrost cycle is most likely to kick in. Since this essentially turns your heat pump back into an air conditioner for a few minutes, this could cause some momentary discomfort. At this time, the backup heat strip will turn on, but the air will be cooler coming out of your vents during defrost mode than during traditional heating mode. Again, this only lasts for a few minutes, and the backup heat strip will turn on to continue to heat your home, but it is important to be prepared for this to occur and to know that the heat pump is working properly when this happens. It is also important to know that during defrost mode it is normal for there to be a slight change in odor (due to the heat strip turning on), to see steam coming off of your outdoor condenser, and to hear some strange noises (knocking, clicking, and swishing). Lastly, it is important to know that the great majority of systems which suffer from Dirty Sock Syndrome are heat pumps. Dirty Sock Syndrome is when an odor of dirty socks comes out of your HVAC system and it is caused by bacterial build up on your coil. Since the evaporator coil in a heat pump can range from around 40 degrees to around 140 degrees, it tends to attract this bacteria. When purchasing a new HVAC system or learning about your current system, it is important to know what you can expect. Only you can decide what type of system best fits your needs. At the end of the day, we recommend choosing a heat pump if you find yourself heating your home during the winter to 72+ degrees. On the other hand, we would recommend choosing an air conditioner if you hardly ever use your heat or if you only turn on your heat momentarily to take the chill out of the air. If you have any questions, we are here for you!